Made with with phosphoric acid. No harm to septic tanks. If your Saniflo keeps running on, won’t start or stop could be due to limescale being present on the membrane this controls your Saniflo. 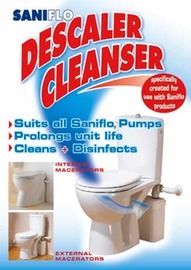 Using Saniflo Descaler when used at least once or twice a year can prevent bad odours occuring, keep all the pipes free from limescale, this is good for your Saniflo particularly if you live in a hard water area. Many Saniflo owners do not use the Descaler and this can cause limescale problems early on, use it regular to achieve the best results. Always follow manufacturers advice, please read the label.